The countdown began months ago. In fact, the date has been marked, in big bold Sharpie letters, on my house calendar, leaving no doubt as to what’s happening that Monday night: GAME OF THRONES. Season 7 begins on July 17, and it could not come quickly enough. What have we all been amusing ourselves with for this past year without dragons and wildfire and direwolves and swords and Daenerys Targaryen? Well, I’ve been passing the time by reading fan theories. 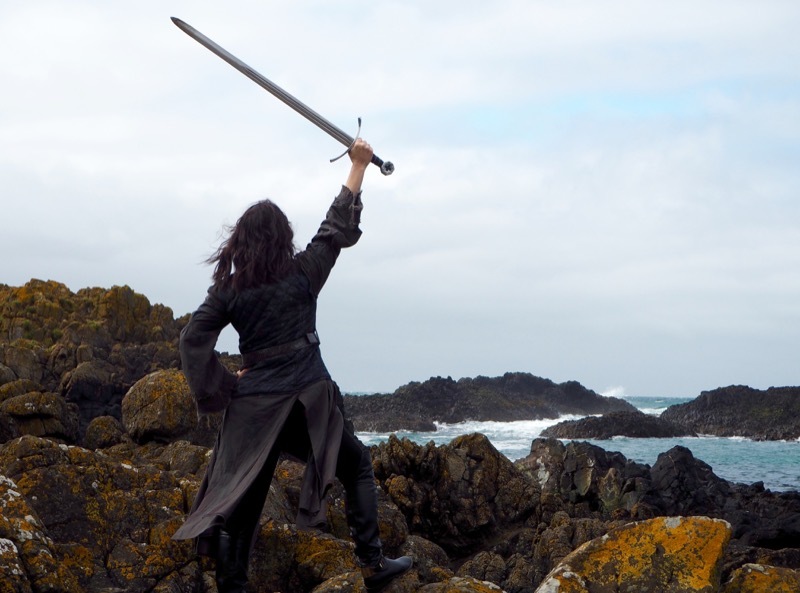 Oh, and travelling to Westeros (also known as Northern Ireland) to visit as many of the Game of Thrones filming locations as possible, wielding a sword for as much of the journey as I could. How about you? Around 80% of the whole show is filmed in Northern Ireland, both on location and in the massive Titanic Studios in Belfast. And it’s easy to see why. With landscapes that truly look like they’ve been dropped in from another world, it doesn’t take much imagination to picture yourself standing in the Seven Kingdoms, preparing to claim your rightful place on the Iron Throne. Just 40 minutes from the city of Belfast lies Castle Ward, better known as Winterfell. The Stark family’s castle was set around this National Trust property’s tower house, which you may recognise from the first season (with the help of some elaborate set dressing and CGI). As we were driven to Winterfell, we were told that we’d be meeting some cast members (but we weren’t told who). With visions of fangirling over Kit Harington, or taking selfies with Hodor, we stepped off our bus and were greeted by Thor and Odin, who you may know as Grey Wind and Summer, Robb and Bran Stark’s direwolves. We probably fangirled harder over these two beautiful doggos than we would have over Kit. While their owners, a family who have all been in a number of episodes themselves, told us all about their two Northern Inuit pups, the dogs busied themselves by sniffing at their delighted audience. But these direwolves, celebrities as they are, had other engagements to attend elsewhere in Westeros, so after plenty of selfies, they left us (not before we followed them on Instagram) to our medieval banquet inside a massive teepee. With a fire blazing inside, and rain pattering on the walls of the giant tent, we wolfed down (yes, pun definitely intended) our soup, bread, fruit and wine – the kind of fuel we’d need for the rest of the day’s activities. Sufficiently full, we walked across the courtyard to the Armoury to be kitted out in cloaks, leather doublets and, most importantly, swords. 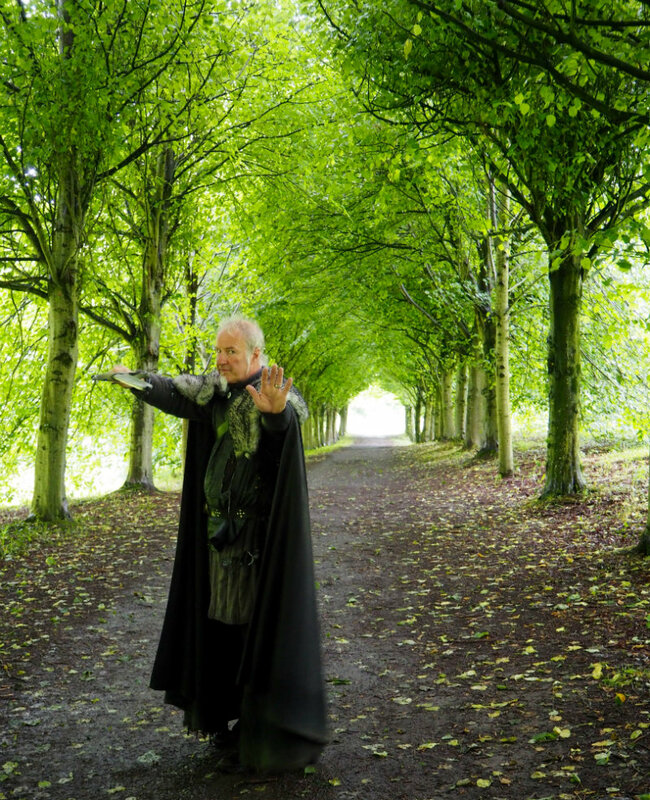 There was plenty of heated sword fighting before we set out to explore the grounds, home to 20 Game of Thrones filming locations. From Walder Frey’s The Twins to Baelor’s battlefield and the tree branch where Brienne confronted the Stark men, I stood in the very places where some of my favourite scenes took place. Although we walked (and drove a little to stay out of the rain), visitors to Winterfell can do a self-guided bike tour of the grounds, which includes a map of all of the locations, a costume, and an iPad so you can watch the scenes that were filmed on the grounds of Castle Ward. 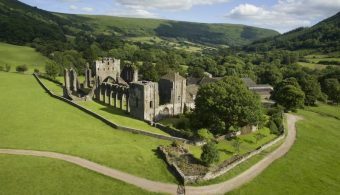 And if that’s not enough Winterfell for you, you can always stay overnight in a glamping pod in the forest. Before we left, there was time for one more Game of Thrones experience: archery in a recreation of the Winterfell set that was featured in Season 1, episode 1. You know, the one where Ned Stark says to Robb, And which of you was a marksman at ten? Keep practising, Bran. Still dressed in our badass garb, we nocked, drew and fired our arrows at the targets in front of us. I’m sad to report that I was pretty terrible, but I’ll take Ned’s advice and keep practising (not quite sure where, but that’s a small detail). Where to stay: Europa Hotel, Belfast (for a bit of luxury after your day in the North). Getting there: see driving and public transport directions here. Book your experience with Winterfell tours. You can also book an immersive Direwolf Tour, which includes a short visit to Winterfell. Want to see more of Belfast? I wrote this guide to the fascinating Northern Irish city earlier this year. This promontory fort from the Bronze Age was the site where Ned Stark beheaded the Night’s Watch deserter in Season 1, Episode 1, but it’s been used as other locations, too. Like the spot where Sansa looked out over Winterfell as Littlefinger made her decide whether to marry Ramsay Bolton (boo, hiss). 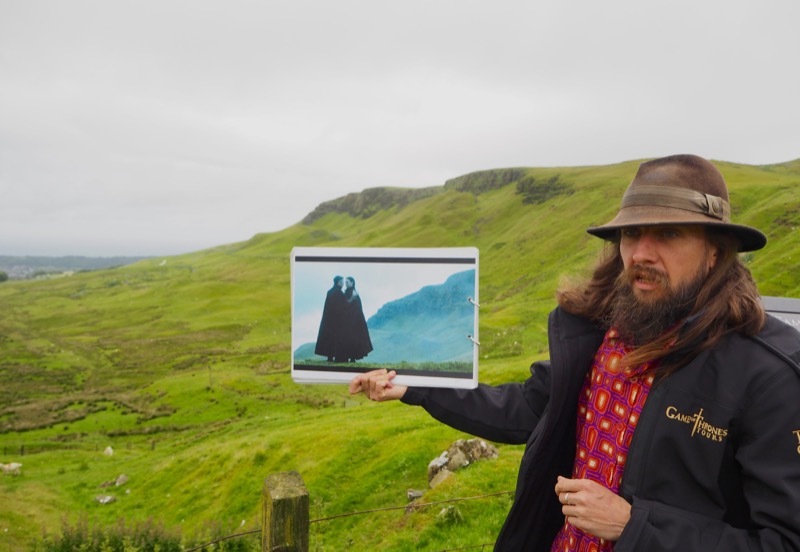 You probably wouldn’t recognise it unless someone pointed it out to you, which is why doing a tour really is the best way to see as many Westeros hotspots as you possibly can in one trip! Remember when Arya got stabbed by the Waif (disguised as an old woman), then tumbled into the water, and emerged, gasping and bleeding, on the steps of the harbour at Braavos? 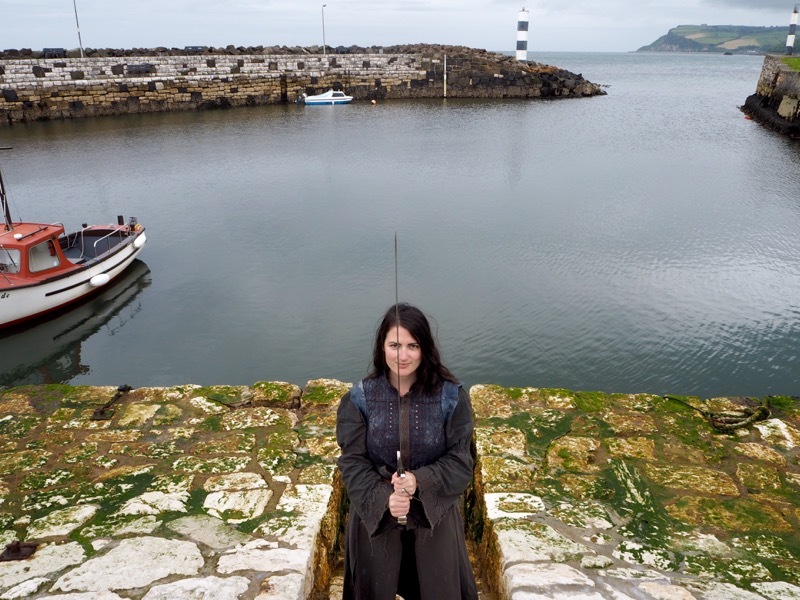 Well, those steps are in the quaint and picturesque Carnlough Harbour, where you, too, can clamber up the stairs and pretend you’re Arya (but with less blood, because, gross). One of the most memorable – or perhaps I should say disturbing – scenes of Season 2 was when Melisandre, the Red Priestess, gives birth to her creepy assassin shadow baby in a gloomy cave. In real life, the cave on the coast is much less menacing, although I’m sure I’d tell another story if I visited at night. Renly Baratheon’s camp is actually the lush green Murlough Bay, which offers spectacular views and dramatic cliffs. Shame about that shadow baby assassin roaming around, though. Oh, and it’s also the scene where Theon took that horseback ride with his (unknown to him then) sister Yara. This was my favourite of all of the locations we visited. 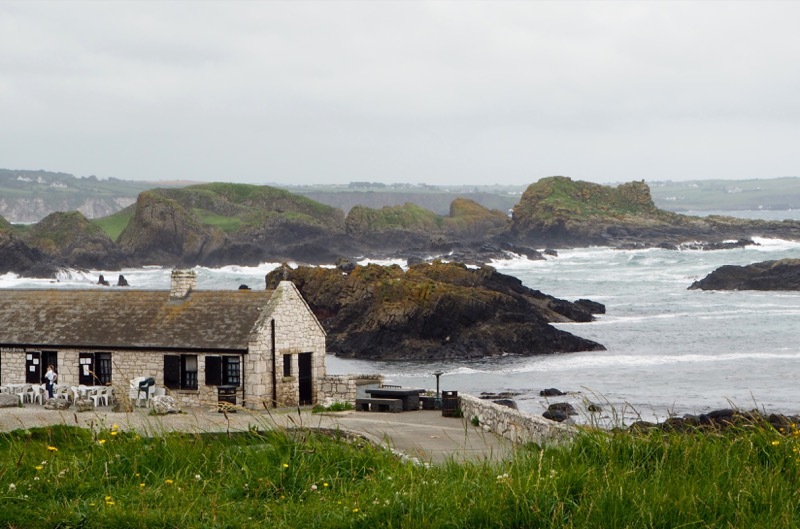 Whether you’re a Game of Thrones fan or not, you’ll fall in love with this wild and dramatic beach and the quaint fishing harbour that sits beside it. But for Thronies, there’s much more to it than pretty rocks and bobbing boats. It’s better known to us as the Isle of Pyke, one of the Iron Islands thatTheon Greyjoy calls home, and the location where Euron Greyjoy was dramatically baptised. It’s a pretty spectacular spot – the sea is wild, the rocks are jagged, and it takes little imagination to see Lannisport when you look out at the harbour. Obviously we took the opportunity to take a bunch of photos in our awesome costumes (provided for us as part of the tour). 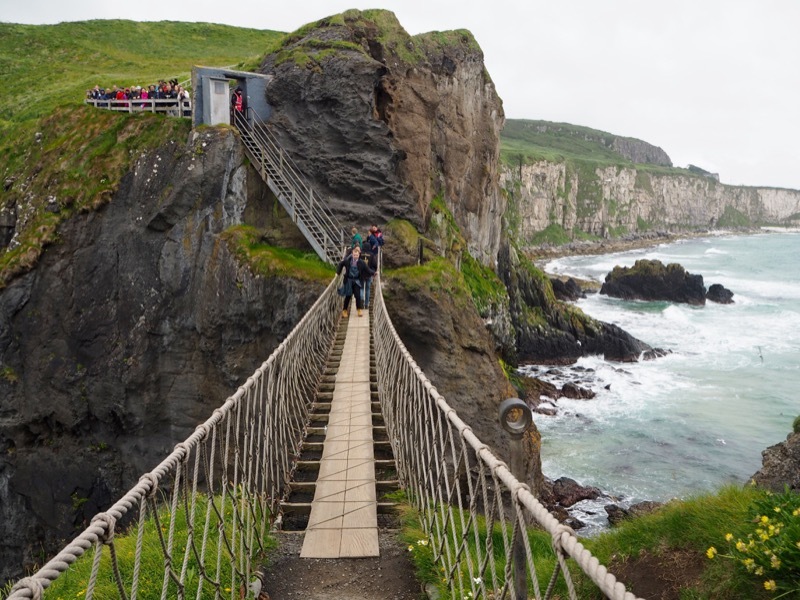 Crossing the rope bridge that featured in the scene where Euron Greyjoy killed his brother Balon, was literally one of the scariest things I’ve ever done. The 20 metre long bridge is 30 metres above the rocks and water below, and it’s swingy as hell (in technical terms, of course). I almost threw up halfway across out of pure fear, and the shaking didn’t stop until well after I’d reached dry land. The worst part is, once you cross the bridge, there’s only one way back. And in 24 mile per hour winds, this was no easy feat. Not for the faint-hearted, but certainly a spectacular sight! I knew about this incredible avenue of beech trees long before I’d even heard of Westeros, but after it was featured as The King’s Road, it shot right up my bucket list. The eighteenth century site is just as stunning in real life, but it’s pretty busy and difficult to get a good shot. My best tip is just to be patient. We arrived at about 5:30pm and were lucky that no tour buses were around, so it was just a matter of waiting for the few other tourists to walk out of view to snap a few good pictures. In January 2016, a storm swept through the Dark Hedges, knocking some of the beautiful trees down. Rather than wasting the wood, it was turned into a series of ten intricately carved doors, each representing an element of the world of Game of Thrones. In true Northern Irish fashion, they’re all located in pubs and hotels so you can do something of a Game of Thrones themed pub crawl. Don’t forget to get your Journey of Doors passport stamped at each door location! OK, this isn’t actually a Game of Thrones location (although seriously, why isn’t it? Look at it! 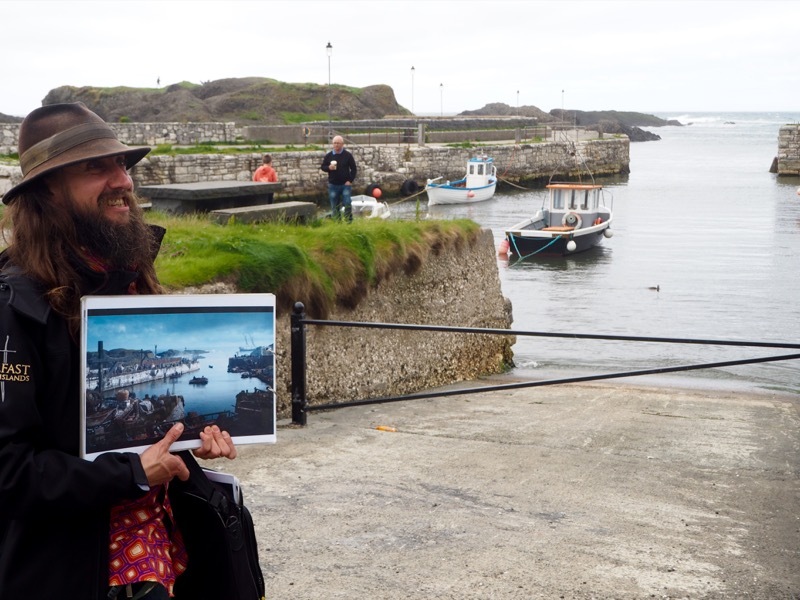 ), but it’s too spectacular to miss while you’re on the Causeway Coast. 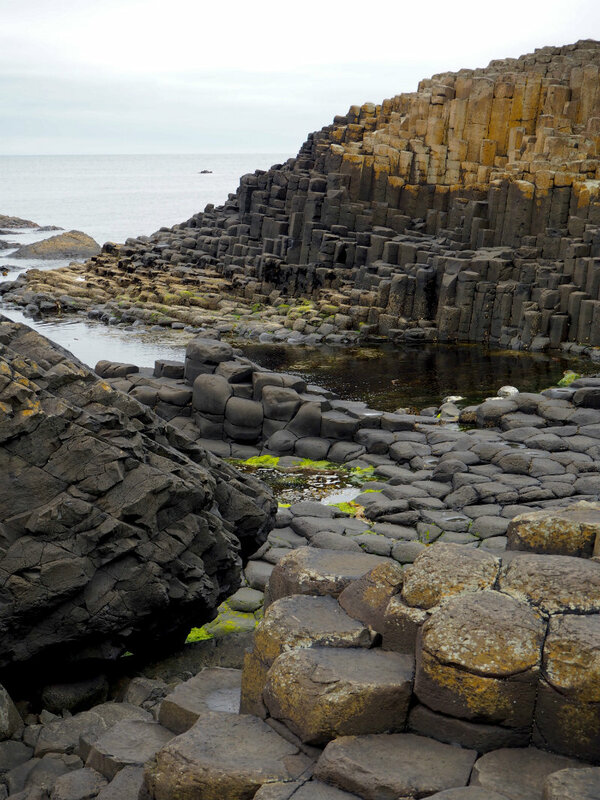 Legend has it, the hexagonal pillars were created by a local giant, Finn MacCool, and I have to say, magic is a much better explanation than anything scientific. It’s so surreal – all those symmetrical rocks at different heights – it makes you feel like you’re in some kind of life-sized video game! A few of us just sat on some of the stones (which are surprisingly comfy) and listened to the water lapping down below. It’s stunning, majestic, and well worth the journey, despite it not being an official Westeros destination! This castle, perched on the cliffs overlooking the ocean, is the home to the Greyjoys, and also known as Dreadfort. CGI was used to make the castle look bigger (the real one is actually crumbling into the ocean, bit by bit) but it still looks pretty impressive. 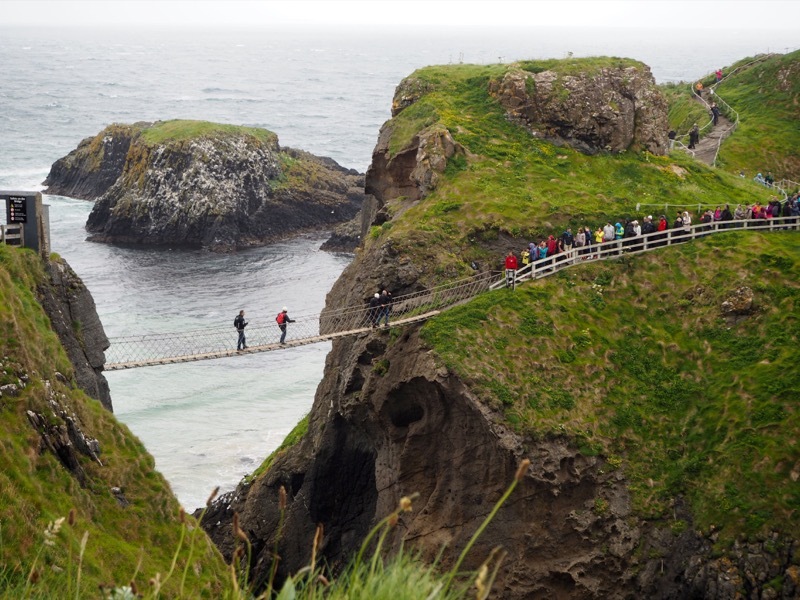 As I’m terrified of heights (see rope bridge, above), I’d hate to walk around this site, but you get the best views from a distance anyway! This beach (a gorgeous, sandy stretch that on a sunny day would be pure epicness) is the site where Melisandre burned the wooden effigies of the old gods, the Seven, at Dragonstone. Mussenden Temple stands guard on the cliffs overhead, giving the beach something of a regal air. Although this post doesn’t cover all of the locations we visited around Westeros, these were the highlights for me. I could have spent weeks just soaking up the natural beauty of the area, and catching up on six seasons of Game of Thrones. Basically, this tour was two days of unbridled joy for a Thrones fan like me. Getting to dress up in costumes, watch scene after scene from the show, learn about all the gossip from the sets (our guide was an extra in a few seasons, including the famous Battle of the Bastards scene, or ‘Bob’, as he calls it), was so much fun that I had a permanent smile on my face. 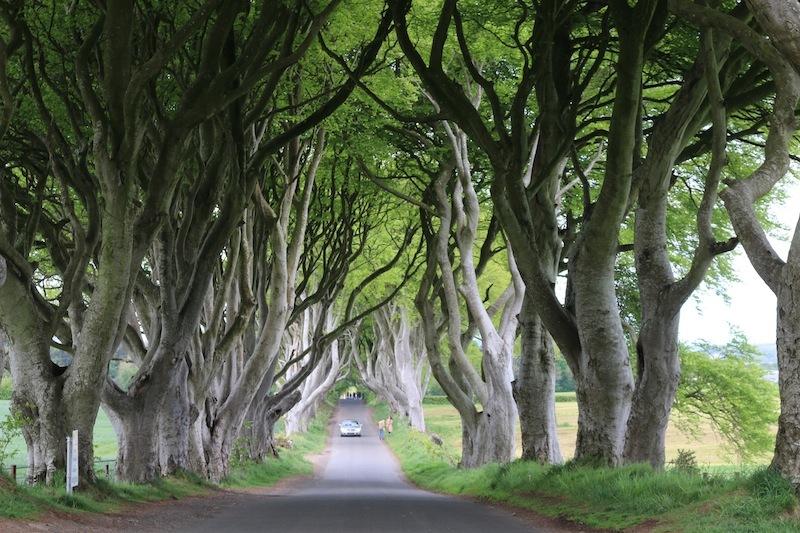 Where to stay: Game of Thrones Tours do go from Belfast or Dublin, but they also can be arranged from Derry (and with a new direct flight with bmi regional from London Stansted from just £44 each way it’s a great option!). Book your immersive full-day tour with Game of Thrones Tours (it won’t be exactly the same as what we did, but it will be unforgettable). And while you’re in Derry, I highly recommend checking out Far & Wild for a longboarding lesson followed by a brewery lunch. 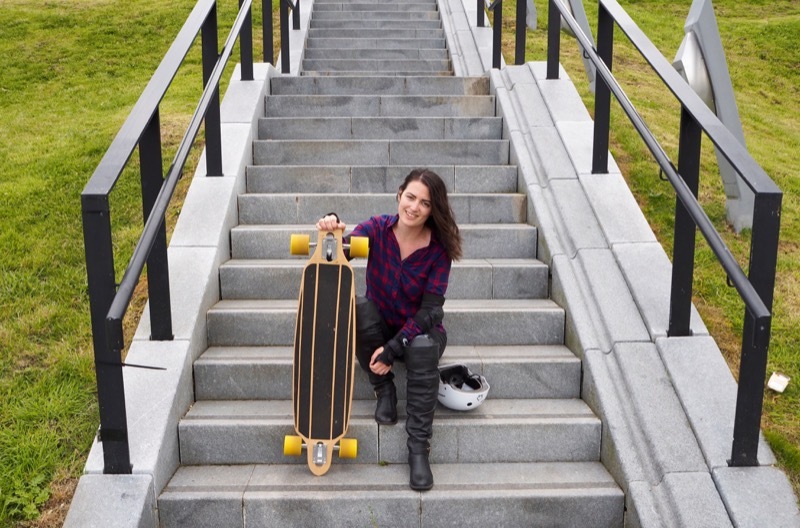 It has absolutely nothing to do with Game of Thrones, but after swinging a sword around Westeros for a few days straight, give your arms a rest and skate around the city! 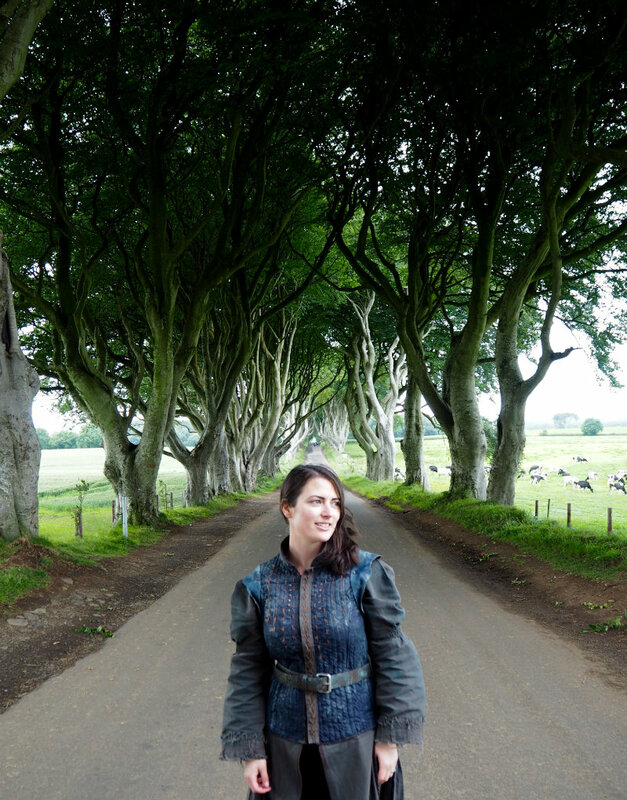 Thanks so much to Tourism Ireland for taking me on this epic journey through Westeros! I am so jealous. In fact I think a new word needs creating as jealous is a mere suggestion of how much I would love love love to do this. I am resisting checking flights… but I suspect that I am going to give in very soon. DO IT! Honestly, it’s so worth it – and you don’t even have to travel far to immerse yourself in Westeros! Have you watched episode 1 of S7 yet?? Such an epic trip and what a fab write up Lauren! Love this. Memories forever. I’m a huge GOT fan! I went to Croatia a few months ago, and visited the sights in Dubrovnik & Split. 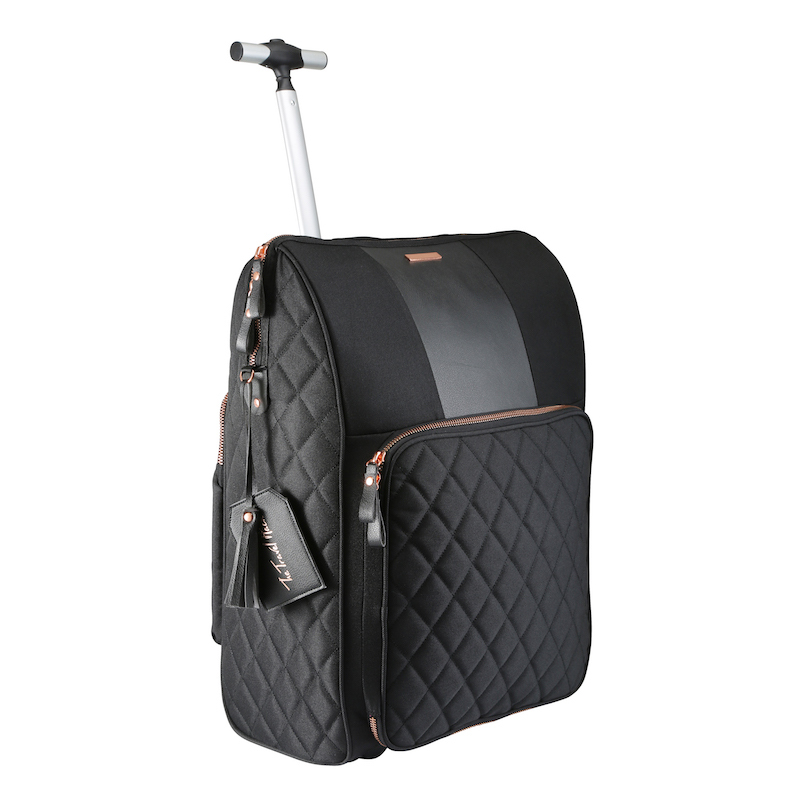 I’m also going to be in Ireland for TBEX in October. I’m not sure how long I’ll be in Dublin, but if I have a few extra days, I’ll definitely be doing a day tour. Yes! Definitely book a tour while you’re there, it’s worth staying an extra few days! Isn’t Dubrovnik great for GoT scene spotting? Plus, it’s just a stunning city, so it’s a win-win for fans like us. Ah, so great, brings back good memories! I did most of the same tours and LOVED it! Also loved that guide at Castle Ward, he had some amazing stories, right? Really enjoyed visiting Northern Ireland, even if you’re not a GOTR fan, the scenery is amazing ? Isn’t William the best? He made the tour so much more immersive, he was in character the WHOLE time! 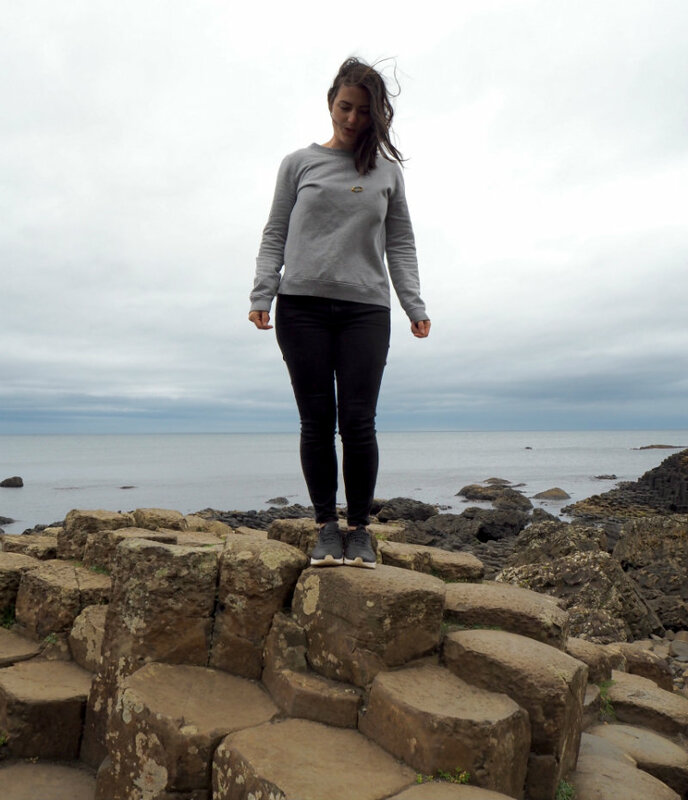 I’m properly obsessed with Northern Ireland now, and not just for the Game of Thrones fun. I didn’t get to go to the studio, although I saw it from the outside. Can you do tours of it?? THE DIREWOLVES!! Oh man, this whole adventure looks amazing, but those pups! That’s so very cool that you got to meet them! These locations are really amazing. I would love to visit these locations anytime soon. These are places that you don’t get to see everyday. It’s like you are transported to another time and place. Me and my friends would truly enjoy this vacation especially that it is a GOT location. I’m excited to meet those direwolves as well.